What Is The Best Edge Control For All Hair Types? Home » Reviews » What Is The Best Edge Control For All Hair Types? 2. What is the Best Edge Control for Hair? 4. How to use edge control? 5. How to slick back hair? 6. How to make DIY edge control? 7.1. How to keep your edges straight? 7.2. How to lay your edges? 7.3. How to slick back curly hair? 7.4. How to slick back hair without looking greasy? 7.5. What are edges in hair? 7.6. Can kids use edge control? 7.7. How do you remove edge control from your hair? 7.8. Is it safe to use edge control for sensitive hair? 7.9. How many times can you use edge control? 8. What Is The Best Edge Control? Getting flawless looking hairstyles without those pesky baby hairs standing out can be nearly impossible to achieve if you don’t have relaxed hair and if you don’t have any product to fix your hair with. One way to get hairstyles with a perfect finish is by getting the best edge control. If you look around, you will find different kinds of edge control made for all sorts of hair. With so many available choices, you may even find it a bit frustrating to see the best one for yourself. Fortunately, we already did all the research and testing for you. All you have to do now is to take a look at our simple buying guide, and you’ll be one step closer to finding the best edge control for your hair. Here is a simple table that will tell you a bit of information about the products we will cover in this buying guide. Below you will see the brands we chose, the product’s featured ingredients, how firm the edge control’s hold is if it can prevent flaking if it’s greasy, and how much is in each container. Before you read about every one of these products, try to familiarize yourself with them first by looking at this table. What is the Best Edge Control for Hair? Knowing about the brand, features, and the amount of product may be enough information for some people to understand which product to purchase. But if it’s your first time buying edge control, you may need to find out a little more about the products you are checking out to ensure that you make a sound purchase. Try to read these short reviews we made for each product to know which one is the best edge control for black hair, thick hair, nappy hair, curly hair, etc. One product comes to our mind when looking for the best edge control for most hair types, and that’s the Hicks total transformation edge control gel. We can’t deny that this product holds most hair types very well. It is very simple and easy to use too. All you have to do is take a small amount and spread it on your edges and scalp. You can even achieve shinier and straighter looking hair by combing through it. We also loved how this product doesn’t make hair look greasy at all. It doesn’t flake, it’s not too sticky, and it can be easily rinsed out with some shampoos. Lastly, we loved how this product was packaged. It comes in a sleek container that can be placed effortlessly in your bag. It’s a great piece of edge control that you can take with you when you’re on the go. If you are trying to find the right edge control product for your hair, this product will help you get those perfectly smooth edges and frizz-free hairstyle. Here’s a short video that you can watch when you try using the Hicks Total Transformations Edges Styling Gel. The best way to finish up freshly pressed hair is a layer of edge control that will keep all your hairs in place. If you’re the kind of person that likes to press your hair, you may find that the best edge control in this roundup is the Organic Root Stimulator Monoi Anti-Breakage Edge Control. Using this edge control just after you press your hair won’t leave you with oddly stiff hair. It has this flexible hold that will make your hair look entirely natural as it stays in place. 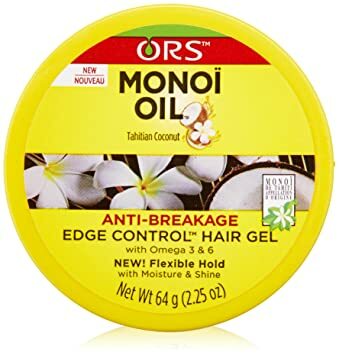 Another thing that makes this edge control ideal for pressed hair is that it comes with Omega 3 and 6 that can help prevent hair breakage and reinforce moisture and shine. Lastly, this edge control has a terrific scent that isn’t overwhelming for the nose. If you don’t use shampoo regularly, this product will have your hair smelling fresh throughout your day. If you would still like to learn about the Organic Root Stimulator Monoi Anti-Breakage Edge Control, try to watch this short video review. The best edge control should be able to keep your hair completely in place for at least half a day right? Well, this edge control from Ebin promises to keep your stray hairs all smooth and flat on your head for up to 24 hours. If you just can’t seem to get those stray hairs in place, allow us to introduce you to Ebin New York’s 24-hour edge tamer. Whether you have thick, nappy, relaxed, or curly hair, this product will keep all of your stray hairs down because it has a firm hold. 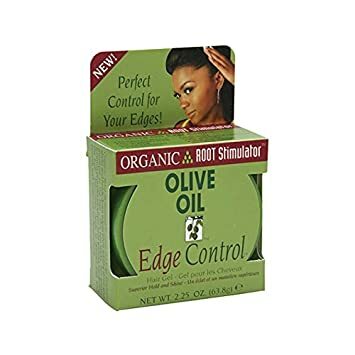 This edge control product can also help you get smoother hair because it is equipped with healthy argan oil that acts as a great hair moisturizer. Lastly, it comes in a decent amount that can make it last for at least three weeks of daily use. Without a doubt, this edge control product can give you the best bang for your buck. 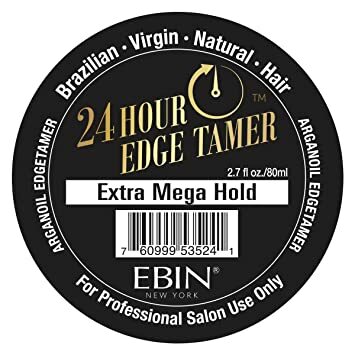 Know more about Ebin New York 24 Hour Edge Tamer in this short review and demo video. 4C hair can be a pain to smoothen out. But if you have the best edge control product at your hands, you will be able to effortlessly get those perfectly smooth edges in no time. The Ampro Shine 'N Jam Hair Conditioning Gel is one of the best choices today for 4c hair because it holds very well and doesn’t make the hair look greasy, unlike other edge control products that can add an unflattering shine to 4c hair. This product can also help you get soft and hydrated hair. If you have dry and frizzy hair, you might be happy to know that this edge control gel comes with olive oil and is completely alcohol-free. We also loved how this product was straightforward to spread evenly on the hair. It’s also not that hard to rinse off your hair like other edge control products that turn gunky when wetted with water. Find out more about Ampro Shine 'N Jam Hair Conditioning Gel in this quick video review. The last product we included for our best edge control roundup is the Organic R/s Root Stimulator Olive Oil Edge Control Hair Gel. We added this product to our list because it works well on relaxed hair. Upon applying this edge control product to your hair evenly, you will immediately notice how easy it is to style your edges. We specially liked how this product didn’t harden the hair at all. If you are looking for an edge control product that will give you that perfectly slicked hair throughout the day, this one will help you get the job done. What’s more is that it can also moisturize your hair and add shine to it in the most natural-looking way. Well there you go, that’s our list of the best edge control products you can find on the market today. If you want to find the best edge control for your hair, we encourage you to learn a little more about edge control products. Doing so will give you more insight on edge control products and make you more capable of choosing the right product for yourself. Below you will learn all sorts of things about edge control including how to use it, how to make it, safety precautions, and handy tips that you can try to get that perfect hairdo. Are you all set to learn more? Let’s go! How to use edge control? Using edge control is simple right? You just have to spread some on your hair until your edges are smooth and there are no more stray hairs sprouting all over your head right? Well yes, you can use edge control that way. However, if you want to get the best out of your edge control product, you must try the most efficient way to use it. Though edge control products can help get those edge smooth on their own, you can still get more out of edge control products by using a couple of simple tools. To get super beautiful edges, try to prepare a hair brush, oil, and a satin scarf. Don’t forget your edge control product of course. Now the first thing you should do is apply your edge control and some oil to your edges. When doing so, try to push your hair back with your brush. Brushing the product into your hair will help smoothen the product out. Once the product is in your hair, the final step to having smooth edges that will last through the day is taking that satin scarf and tying it around your head. Make sure your edges are secured and pressed by the satin scarf. Leave the satin scarf in place from 15 up to 30 minutes. Having the scarf tied around your head will let your hair dry better and will keep your edges down . How to slick back hair? You can use edge control to keep your hair looking perfect in many ways. One thing you can do is to get slicked back hair. Slicking back your hair can be a bit similar to keeping your edges own. The only difference is you would have to use a couple more products to keep your hair perfectly slick . The first thing you should do is dampen your hair. See to it that your edges are laid down all smooth and sleek. This can take somewhere from a minute up to five minutes depending on what kind of hair you have. If you have soft natural hair, it can take you up to two minutes. However, if you have thick curly hair or 4c hair, you may take a long five minutes. To adequately dampen your hair, you can try spraying it with water. We prefer the mist method since it makes for fewer errors. After all, you wouldn’t want to end up wetting your hair instead of dampening it. If you don’t have a spray bottle lying around, you can also try using a hair brush. Get your hair brush wet by running it under water and then brush your edges with it. Once your edges are all damp with water, try to apply some gel to your hair. The gel will make your hair look all polished, smooth, and extra sleek. The gel can also help you keep those stubborn hairs down. For this step, we suggest you use gel with flexible hold. Try to avoid strong hold gels since those kinds will make your hair look and feel hard to the touch. This step can be optional. You can take this action if you live somewhere with humid weather. Otherwise, you may want to skip this. Humid can make hair feel greasy and oily. If you want to slick back your hair, greasiness or oiliness is one thing you should avoid. Try to use a humidity blocker and apply it to your hair and edges. The effect of a humidity blocker can last for days depending on what brand you use. For humidity blockers, we suggest you use water based ones because it does a pretty good job at hydrating the hair while keeping it free of humidity effects. Use a damp brush again to slick back your dampened and gelled edges. We found that using a baby brush instead of a regular hair brush does the job much better. For the finishing touch, you should seal up your edges with some oil. Doing so will prevent your hair from getting hard and will significantly lower the effect of flaking. It also makes edges look and feel smooth. If you have stubborn hairs, we suggest using a scarf to press down those hairs. Try to use a satin scarf and tie it all over your hair to keep everything pushed down. You can do this for 30 minutes or even overnight if you want to get that perfect slicked back hair. How to make DIY edge control? Don’t have time to go to the store to get edge control or can’t find any edge control product that works well on your hair? Don’t sweat it. You can still get smooth edges and slicked back hair. Making your own edge control product is very easy. You just have to get the right ingredients and follow the correct steps . Flaxseed gel can help you get that medium hold that won’t make your hair look and feel as if it were a crunchy cheeto. If you have frizzy hair or if you’d like to revive your edges, castor oil will do the trick. Including this in your edge control will not only make your mix great for hairstyles but for hair health as well. Another thing that usually comes with edge control products is Glycerin. It’s a natural ingredient that can help get moisture from the air and transfer it into your hair. It can help prevent the edge control from turning too thick and snappy. All in all, Glycerin can help make your hair more manageable to lay down. Notice how thick edge control products are? The key ingredient that thickens edge control products is Guar Gum. You can get a small jar of Guar Gum from your local supermarket or online. Unless you’d like to use a fragrance-free edge control product, you may want to add a couple of ingredients that can help you achieve fresh smelling hair. We suggest using a couple drops of your favorite essential oil. The first step to getting your very own edge control product is cooking the flaxseed gel, glycerin, and guar gum in boiling water. Be careful not to put in too much flaxseed gel to avoid getting way too much gel than you need. You may need to do some trial and error with this step. Just make sure that you end up with a mix that’s not too loose or too sticky. Once you get the perfect gel consistency, try to add a little bit of castor oil. Just add a little bit to make the extra gel lose. Adding too much may make it too greasy for your hair. Once everything is all mixed up, the last thing you will need to add to the edge control is the fragrance. Add a couple of drops of your favorite essential oil to ensure that your edge control gets entirely covered up with the scent. The last thing you should do is store your edge control in a cool place, preferably your fridge. If you’d like to bring your edge control with you at all times, you may want to add in some preservatives to keep it fresh all the time. Try to watch this video to learn how you can make your own DIY edge control. Though edge control products are pretty simple things, you’d be astounded as to how many questions people ask all sorts of questions about it. Just in case you have questions yourself, we went ahead and answered the most common questions for you. Take a look below and find out the answers to the questions you have in your mind. How to keep your edges straight? Keeping your edges straight can be a pain to do without the right products and materials at your disposal. The simple way to keep edges straight is by using edge control products, gel, or hair butter. If you don’t have such products with you, you can also try dampening your hair or use oil to keep your stray hairs down and smooth. How to lay your edges? We have found that the best way for you to lay your edges is by using a satin scarf and tying it all over your hair after you apply your edge control product. 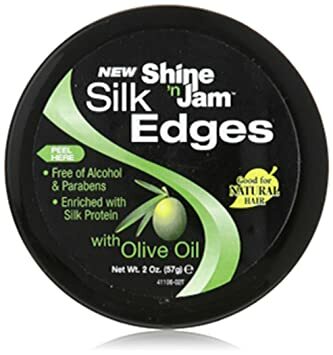 Using alcohol-free gel can also help you get wholly laid edges without drying out your hair. How to slick back curly hair? The key to slicking back curly hair is using an assortment of products and materials including edge control, oil, humidity blocker, and a satin scarf. Don’t forget to use a comb to slick your hair back. Using a comb will allow you to get that finely slicked back hair. How to slick back hair without looking greasy? One common problem that people have with slicking back their hair is ending up with greasy locks that don’t only look greasy but feels oily as well. The best way to get finely slicked back hair without having greasy locks is by using a hairdryer. After applying your edge control product to your hair, brush your hair back and blow dry it as you do so. The hot air will dry out your hair and will make it look fresh and lightly moisturized. What are edges in hair? Edges are those baby hairs you see at the edge of your scalp near your forehead and the back of your neck. Baby hairs can be styled into something more complex with edge control. It can make your hairstyle look extra classic or chic. Edges can either be caused by hormones or genetics. You can also get it from hair breakage or traction alopecia . Can kids use edge control? Plenty of parents keep on asking if they can use edge control products on their kids. The simple answer is yes. However, you must take note that not all edge control products can work well with kid’s hair. If you want to use edge control on a child, try to use edge control products with less harsh ingredients. We suggest you use something organic to keep the child safe from skin irritations. How do you remove edge control from your hair? Some people get frustrated when it comes to removing edge control products from their hair. If you try washing out edge control from your hair with plain water, you might end up with a gunky mess in your head. The best way to remove edge control from your hair is by using shampoo and conditioner. The shampoo will remove all the dirt and dust from your hair, and the conditioner will remove any edge control residue left in your head. Is it safe to use edge control for sensitive hair? If you have edges because of hair breakage, is it still safe for you to use edge control products? The answer will depend on the strength of your hair and the kind of edge control product you have. If your hair is too weak, you may be better off using other products such as hair butter or oils. You may also want to use edge control products with hair strengthening ingredients. How many times can you use edge control? Plenty of people worry that using edge control too often may lead to hair breakage. The truth is, if you have healthy hair, you can use edge control as much as you would like. In fact, using edge control can even be beneficial to your hair health if it contains the right ingredients. Before we end this buying guide, let us take a short test. This test is pretty easy, so don’t sweat it. You may even form a more solid decision after you take this quiz. Get your thinking caps on! Let’s see how well you know edge control products by now. What Is The Best Edge Control? For this roundup, we deliberated five different edge control products including ones from Hicks, Ors, Ebin, and AmPro. All of the products we have included in this roundup are amongst the best edge control products in the market today. However, even though these products work very well, there is still one product that reigns as the best edge control. After carefully deliberating these products, we found that the best edge control is no other than the Hicks Total Transformation Edge Control Gel. What made us declare this product as the best in this roundup is the right amount of hold it offers and its compatibility with most hair types. What’s more is that this product can offer you the best aesthetics because it doesn’t cause flaking and it’s not as greasy as other edge control products. 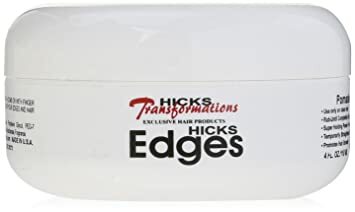 Overall, Hicks total transformation edge control gel is a great product that you can use to lay your edges, get slicked back hair, and achieve an entirely polished hairdo. Well, that covers it! That’s our short buying guide for finding the best edge control in the market today. We hope you enjoyed reading this article and that you learned a lot from us. Expect more buying tips like this as well as other beauty tips that you can practice every day. If you liked this article, please don’t forget to show your support. We love seeing how much help we give to our readers, so don’t hesitate to share this with your friends. Thank you!